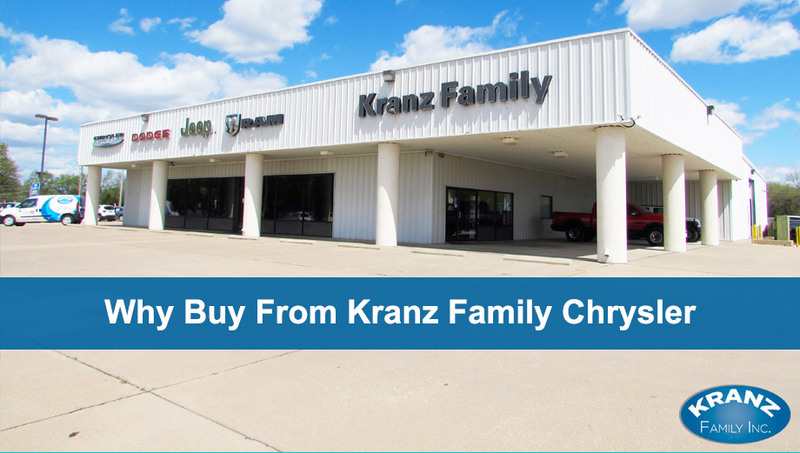 Why Buy From Kranz Family Chrysler | Kranz Family, Inc. If you've been thinking of buying or leasing a new vehicle, be sure to come to our Dodge, Ram, Jeep and Chrysler dealership in Newton, KS! We have a wide selection of the latest models for you to choose from. If you're in the market for a Jeep SUV, we have the new Jeep Wrangler, Cherokee, Grand Cherokee models and plenty more. Prefer to head off in a classy Chrysler? We have the Chrysler 200 on our lot, along with the new Pacifica minivan that can handle the whole family. If you need a Dodge, we have an array of new models. If you're interested in a new pickup, we have the latest Ram trucks on our lot, too. Searching for a used vehicle? Our certified used vehicles come with specified comprehensive coverage, so you can buy with confidence knowing you're well protected. Whatever is your prerogative, the experienced sales team at Kranz Family Chrysler Dodge Jeep Ram is here to help you. Our dealership is the only locally-owned franchise dealership in Newton, KS, and when you come to buy a new Jeep from us, know that you're dealing with a top-notch team every step of the way. After you've found the perfect vehicle that fits your needs, keep it in great condition with our service department. If you're in a rush, you can even visit our Express Lane and get oil changes completed quickly! If your car or truck is in for more extensive service, feel free to wait in our excellent customer lounge that provides you with free Wi-Fi and fresh coffee, or you can drop off your car overnight with our night drop option for service customers. There are plenty of reasons why you should buy from Kranz Family Chrysler Dodge Jeep Ram, so make sure to pay us a visit when you're ready to buy a new or used vehicle!